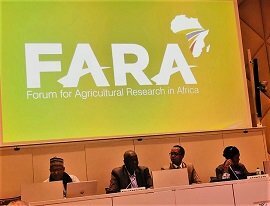 FARA Hosts Regional Consultation Meeting on Rolling Out of the Science Agenda for Agriculture in Africa for West, Central and North African Countries. The regional consultation on rolling out the Science Agenda for Agriculture in Africa (S3A) for Central, Western and Northern African countries started on Tuesday, 10th May, 2017 at the Secretariat of the Forum of Agricultural Research in Africa (FARA) in Accra, Ghana. The consultation was a three-day event organized by FARA in collaboration with the West and Central African Council for Agricultural Research and Development (CORAF/WECARD), the North African Agricultural Sub-Regional Organisation (NAASRO) and the Council for Scientific and Industrial Research (CSIR) of Ghana. The workshop was designed to sensitize participating countries on the status of S3A, craft a Theory of Change and result framework as a means of mainstreaming the agenda in line with the CAADP-Malabo targets. Similar consultations were earlier held in Rwanda and Malawi. L-R: Dr. Alioune Fall, Executive Director CORAF/WECARD, Hon. (Mrs) Patricia Appiagye, Deputy Minister, of Environment, Science,Technology and Innovation, Ghana, Dr. Yemi Akinbamijo, Executive Director of FARA and Prof. Mahmoud Medhany, Executive Director of NAASRO. The special guest of honor at the occasion was Honourable Minister of Environment, Science, Technology and Innovation of Ghana, who was represented by Hon. Mrs. Patricia Appiagyei- the Deputy Minister of the Ministry. The event was moderated by Dr. Genevesi Ogiogio, Member UNDP-OECD Global Partnership Monitoring Advisory Group and Executive Director, Africa- CID. The opening ceremony started with welcome address by the Executive Directors of FARA and NAASRO, the Chairman of the CORAF Board and the Director General of CSIR. In his address, the Executive Director for FARA, Dr. Yemi Akinbamijo welcomed all the dignitaries and participants, he thanked representatives of all governmental and non-governmental organisations present and described the gathering as a high-powered delegation that has the potential to impact on the food security of Africa. He highlighted the critical roles the Director-Generals of the various institutions present would play in midwifing the S3A as they lead on the ground to tackling the challenges of agriculture at the grassroots. The Executive Director stated that FARA is mandated to coordinate the S3A which is of political significance as it is endorsed by the ministers of states. This agenda, he said, “has a game changing potential for science in Africa.” He further stated that the agenda of making Africa food secure and a world bread basket by the year 2030 is only possible with the inputs of the Director Generals of the various National Agricultural and Research Systems of Africa. Participants at the event included leaders of the National Agricultural and Research Systems (NARS) of West, Central and North African countries. In her speech, Hon. Mrs. Patricia Appiagyei highlighted that the underperformance of agriculture in Africa is as a result of under-utilization of science and technology right from the level of policy makers through to small holder. She said huge leaps need to be made to advance Africa’s agriculture and this depends on the embracement of science and technology. It was therefore in this respect that the consultation represents an important milestone in the transformation of Africa. While welcoming participants to the event and, she expressed gratitude to FARA for selecting Ghana as part of Tier One of the Science Agenda and affirmed the commitment of the Government of His Excellency, Nana Addo Donkwa Akufo-Addo, in assisting FARA to achieve the dream of making S3A a reality. The Director General of CSIR, who was represented by Dr. Wilhemina Quaye, Deputy Director at STEPRI expressed optimism with the new vision as well as the paradigm shift the Science Agenda will bring about for a speedy agricultural transformation in Africa. Addressing the participants, Dr. Alioune Fall, the Chair for CORAF/WECARD Board described the S3A as a guiding principle to science transformation in Africa. He said CORAF is taking advantage of the Science Agenda to scale up agricultural innovations in the Africa Region. In his comment, Prof. Mahmoud Medhany, the Executive Director of the North Africa Agricultural Sub-Regional Organisation (NAASRO) mentioned that Africa represents the potential solution to many of the global economic challenges and that science in agriculture is the baseline for addressing the challenges. The three-day event ended yesterday, the 11th of May 2017, with the presentation of action plan from participating countries, which will be used in the articulation of a working document for mainstreaming the S3A at country level.